It’s an interesting question. Why didn’t Shelby Miller see time in last year’s playoffs. During his media session Sunday afternoon, that was the topic of discussion. That and the fact that Adam Wainwright called him the second strongest guy on the team. He did address the Holliday effect quickly. Overall, over the next 4 times he is asked about the playoff absence, Miller is a cool customer but definitely a man who is still asking himself why he didn’t pitch. He won 15 games. He looked good down the stretch in September, especially in a final home start against Washington. Asking anyone for a real concrete answer is tough business. He isn’t bummed about the rookie of the year voting and isn’t working on a new pitch. He is going with what he had but may incorporate a sinker to get more quick outs. He is also glad that he didn’t get traded because he is right where he wants to be. He has kept in touch with Wainwright in the offseason and will work towards becoming a better starter in 2014. 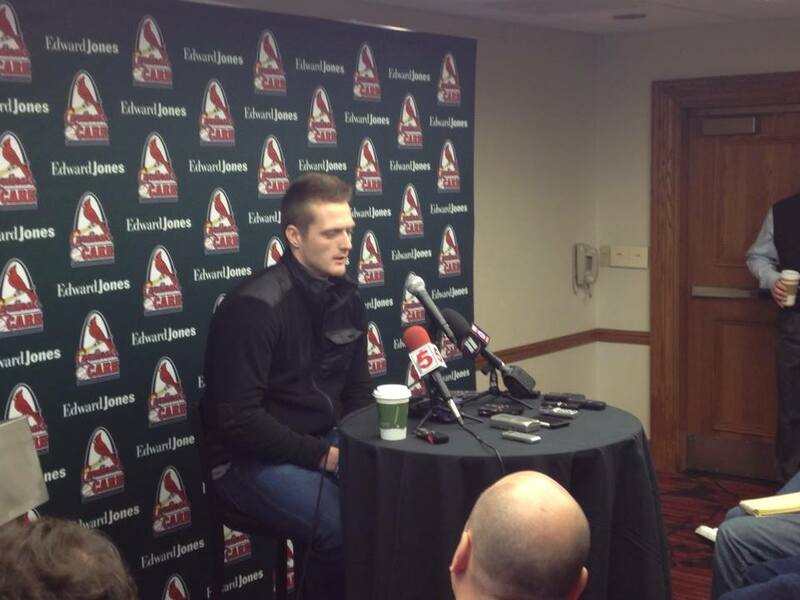 He won’t escape questions about the 2013 postseason until he gets back there and pitches. Weird is the biggest word used by Miller. Weird translates to confusion and out of the ordinary. This much is known. Everybody has their theory but Miller is busy focusing on 2014. Come back later for bits from Carlos Martinez, Jon Jay, Matt Carpenter and Jason Motte in my coverage from The 2014 Winter Warmup. This entry was posted in 2014 Cardinals, General Cardinals, MLB and tagged Shelby Miller, stlcards, Winter Warm-Up by danbuffa82. Bookmark the permalink. Dan Buffa is the co-creator, administrator and writer for the movie website, film-addict.com. He also contributes to United Cardinal Bloggers, Arch City Sports, voicesfilm.com and writes for his personal blog, www.doseofbuffa.com. He is also a published writer for the Yahoo Contributor Network. Dan is a St. Louis, Missouri born and raised writer with a need to inform and the ability to pound out 1,000-1,500 word pieces with ease. When he isn't writing or drinking coffee, he is spending time with his wife and son in South City. Follow him at @buffa82 on Twitter and reach him for thoughts, comments and general feedback at buffa82@gmail.com.